Mack Wolford and his father were both serpent handlers who died of snake bites. (CNN) - Mack Wolford, one of the most famous Pentecostal serpent handlers in Appalachia, was laid to rest Saturday at a low-key service at his West Virginia church a week after succumbing to a snake bite that made headlines across the nation. Several dozen family, friends and members of Wolford's House of the Lord Jesus church in tiny Matoaka filled the simple hall for the service, which lasted slightly more than an hour. At the request of pastor's widow, Fran Wolford, media were forbidden inside the building. Wolford's own dad was a serpent handler who died from a snake bite in 1983. Mack Wolford, who was 44, was bitten by his yellow timber rattlesnake at an evangelistic event in a state park about 80 miles west of Bluefield, in West Virginia’s isolated southern tip. He enjoyed handling snakes during worship services, but it’s a tradition that has killed about 100 practitioners since it started in the east Tennessee hills in 1909. In recent years, Wolford feared the tradition was in danger of dying for lack of interest among people in their 20s and 30s. It’s why he drove to small, out-of-the-way churches around Appalachia to encourage those who handle snakes to keep the tradition alive. He hadn’t much hope for churches in West Virginia, where serpent handling is legal. Some surrounding states, including Tennessee and North Carolina, have outlawed it. He had his eyes on a Baptist church near Marion, North Carolina, where, he said, “there’s been crowds coming” and its leaders wanted to introduce serpent handling, the law be damned. Wolford wanted to travel to the radical edges of Christianity, where life and death gazed at him every time he walked into a church and picked up a snake. That’s what drew the crowds and the media; that’s what gives a preacher from the middle of nowhere the platform to offer the gospel to people who would never otherwise listen. Indeed, others are emerging, including a growing group of 20-somethings clustered around churches in La Follette, Tennessee, and Middlesboro, Kentucky. Their individual Facebook pages show photos of poisonous snakes and “serpent handling” appears on their “activities and interests” lists. 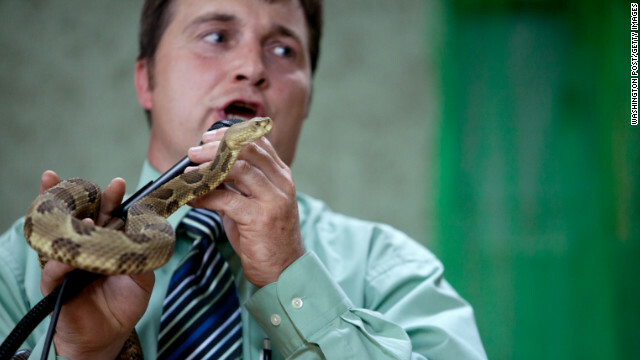 Pentecostal serpent handlers - they use "serpent" over "snake" out of deference to the Bible - are known for collecting dozens of snakes expressly for church services. At church, they’re also known to ingest a mixture of strychnine - a highly toxic powder often used as a pesticide - and water, often from a Mason jar. These same believers will bring Coke bottles with oil-soaked wicks to the church so they can hold flames to their skin. Mainstream Christians - Pentecostals included - do not believe Mark 16:17-18 means that Christians should seek out poisonous snakes or ingest poisonous substances. Thus, a typical service in one of their churches will also include prayers for healing and speaking in tongues. But it’s the seeming ability to handle poisonous snakes without dying from their bites that makes these Pentecostals believe that God gives supernatural abilities to those willing to lay their lives on the line. If they are bitten, they refuse to seek antivenin medication, believing it’s up to God to heal them. At the Church of the Lord Jesus in Jolo, West Virginia - one of the country’s most famous “signs following” churches - a group of worship leaders passed around a rattlesnake at a service last year on Labor Day weekend. The snake twisted as it was passed from man to man. The women clapped, and one tried handling the serpent but quickly gave it back to a man. The pastor, Harvey Payne - who has never been bitten by a serpent - posed for the cameras, the reptile twisting and curling. If a believer is bitten by a snake and dies, these Pentecostals reason, it is simply their time to go. Vicie Haywood, Wolford’s mother - whose husband died 29 years ago from a rattlesnake bite during a worship service - is heartbroken. But she has no doubts about the righteousness of serpent handling. “It’s still the Word, and I want to go on doing what the Word says,” she told the Washington Post on Wednesday. Last fall I asked Wolford if handling serpents wasn’t tempting God, a common question from mainstream Christians. “Tempting God is disbelief in God, not belief in Him,” he said, citing an incident in the Old Testament in which Moses slapped his staff against a rock to provide water in the desert rather than speak to the rock as God had commanded. By using his own resources – a stick – rather than counting on God to act when Moses simply spoke to the rock, the patriarch was condemned for lack of belief and forbidden to enter the Promised Land. He added that he regularly drinks strychnine during worship services, to show God has power over poison. He’d gotten sick from strychnine a handful of times. “I was up all night struggling to breathe and move my muscles and repeating Bible verses that say you can ‘drink any deadly thing and it won’t hurt you,’ ” Wolford told me, recounting one episode. He said a voice in his head taunted him as he struggled to recover. After he was bitten last Sunday, Wolford may have thought his faith would bring him through that trauma, as it had so many times before. He had four spots on his right hand from where copperheads had bitten him. When he finally gave his family permission to call paramedics, about eight hours after being bitten, he must have known his battle was near over. By the time he arrived at the local hospital in Bluefield, he was dead. I am a Christian & I will tell you right now that in the bible it says nothing about handling snakes and burning theirselves. All they are doing is fiddling around with satans power. & I just think that snake handing is absolutly outrageous & inhumane. The Lord does not want us to harm ourselves and really does not want us to play satans works. Snake handlers are typically using Mark 16:18 as justification to do this. They fail to recognize other scriptures, like Luke 7:35. There's little-to-no doubt Christ used hyperbole, e.g. John 6:54, Mark 9:34, and more. There's little reason to believe Christ meant to pick up reptile snakes with one's hands; you'd have to ignore many other scriptures to do that. Biblically, a serpent is Satan or an agent of Satan himself, e.g. Matt 12:34. Christ is saying they won't have dominion over someone in relationship with Him, doing His will with their lives. The hyperbole continues with drinking poison. It's foolish to put one's self in harm's way to prove God will bail you out to prove His dominion, e.g. Matt 4:6. The poison hyperbole is having to deal with the world's ilk, it won't hurt you to have to get your hands dirty dealing with it, again, if you're doing God's will in the process. The -context- being to bring the Gospel to the world, one will naturally have to deal with the world doing so. north face UK cheap Carolina Panthers jerseys new nike nfl jerseys cheap Chicago Bears jerseys Visceral peritoneum The visceral peritoneum is the GI tractâ€™s outer covering. It covers most of the abdominal organs and lies next to an identical layer, the parietal peritoneum, which lines the abdominal cavity. Borsa louis vuitton nfl football jerseys from china Signature Wellness offers sclerotherapy for spider veins. It costs less than surgery and usually does not involve any kind of hospital stay. The process can last up to thirty minutes and then the patient can return to work and other normal activities. The process is said to improve the skin and reduce the symptoms. However, most professional doctors would also clear the risks associated with the procedure. For example, the skin color changes with the treated vein. This discoloration may take up to six to twelve months to return to its normal color. However, it can also be permanent. The process may be a failure and this would mean that varicose veins would return. There may be itching, pain, blistering, pain, bruising where the veins were treated. The other side effects include scarring due to death of the tissues around the treated veins. Sometimes, if the sclerosant escapes through the wall, it may affect the skin. There may be mild or severe reaction to sclerosant. The patient may also suffer from blood clots or deep vein damage. Before the Jew – Roman war roughly in 66AD, we knew that Nasoreans Jew sect opposed the new doctrine invented by Paul that Jewish rites should be abolished and it is only enough to just have faith in heart and be saved. Certainly these Nasoreans do not use Greek gospels that supported Paul. Now the question is, where is the texts used by Nasorean? Or famously termed as Logia of Jesus / Q doc (in Aramaic/Hebrew). Why was it lost after the Jew-Roman war 66AD? What was the purpose of Pauline influenced Romans Fathers destroying it? It is often repeated that snake-handling started in the east Tennessee hills in 1909. However, a Kansas group called "The True Followers of Christ" settled in Langdon, near Hutchinson, and made interesting copy for the Topeka Capital in June of 1909. For their "prophet" and spokesperson John Meyers took a large rattlesnake to a gathering, passed it among sixteen people, and then set it down to roam freely. Three people were bit at that time, and one disappeared. And the founder of Appalachian snake-handling, George Went Hensley, introduced snake handling practices to the Tennessee in 1910. So Governor Brownback, Pastor Phelps, and their like in today’s Kansas need yield to no one. The wacky religious venom Kansas is known for today started there. I have a neighbor who found himself at one of these churches a number of years ago. He wanted to date this girl but the girl's father was a bit uneasy about this (and, in defense of the father, I don't really blame him for this, my neighbor was a bit scrappy back then). The father of the girl said "sure you can date my daughter...if you go to church with her." My neighbor didn't see the problem with this. He winds up in church with them and things start getting a little animated. He thinks to himself "I can handle this, I'm a Baptist". Then people start jumping around and dancing and the like and he thinks to himself "I can handle this, I'm a Baptist". Then they start speaking in tongues. The girl he wanted to date gets involved too but my neighbor still thinks to himself "I can handle this, I'm a Baptist". Then the snakes came out. My neighbor told me "That's when I said to myself, okay, time to go." He left as quick as he could. Girl or no girl he wasn't staying for the snakes. He was willing to put up with a certain amount of craziness but the snakes he said, were his limit. BTW this is a true story. It actually happened. For decades, the Appalachian preacher had taken up serpents (Mark 16:17-18). So, the Devil sent a rattler that hadn't read the Bible. With the preacher comatose, the faithful called upon God; the faithless called 911. Doctors amputated an arm, and saved his life. Recovered, he tells his flock, "See what God can do!" yes God can do wonders , however this verses are to be interpreted in the context of that if you encounter a serpent just as San Paul did nothing will happen , but not to be use as to temptation to the Lord , so they follow half of the verse and not the other half , because it also says that can drink any deadly drink too , see there is not need to be a super holly to know that if you dare to chalenge God and drink Poison you will surely die and won't be by chance like snakes . he said " here ye rebels must we fetch you water " The Lord said because " you failed to sanctify me in the eyes of this congregation." CNN only did this story as an attack on religions deemed strange by some in an effort to stir the whole Romney Mormon church deal.............to scare people. This country was founded by settlers from England that fled there so they could worship freely. I wish people could see how CNN is constantly running stories that ARE DIVISIVE and try to steer people from Republicans and Romney. God does not want us to tempt him with such acts. He was tempting God everytime he preached with a snake in his hands. That is not wise. Preaching the gospel is one thing I support, I'm all for that but preaching and playing with snakes while preaching, you can have dat, because I think that's crazy. Lean not to thy own understanding. I have been browsing on-line greater than three hours as of late, yet I never found any fascinating article like yours. It's beautiful value sufficient for me. In my opinion, if all web owners and bloggers made just right content material as you probably did, the internet might be much more useful than ever before. Probably so. The snake had more in the brain department that these moron preachers. I guess this kind of thing, could only happen in a 3rd Word country! The man's an idiot, and should be up for a Darwin Award. "Handling serpents" is an Aramaic idiom and common in other Eastern languages which, when RIGHTLY interpreted means, "overcoming one's enemies." "Drinking poison" means "attacks against one's character." King James translators knew NO Aramaic language or culture. Jesus spoke Aramaic. They simply mistranslated. Scriptures admonish against tempting God. Taking idioms literally CAN be deadly. So IS unbelief, the ONLY sin that will keep you out of God's Heaven. Very great post. I just stumbled upon your weblog and wished to mention that I have truly enjoyed browsing your blog posts. After all I will be subscribing to your rss feed and I hope you write once more very soon! You do realize you're a nutter, don't you? lol soon enough youll be playin with snakes, and when you die ill laugh like i did when i read this article. Like Mother Gump said: stupid is as stupid does! I love it! Mother Gump said it all.